This smoothie was created for all the raspberry lovers out there. In case you didn’t know, raspberries are my favorite food. My interest in foraging wild foods has since expanded. Although raspberries are still one of my favorite things to harvest. Black raspberries are most common where I live now, and as it turns out they pack more nutrition than the red variety. They certainly live up to the nickname “king of berries”. Black raspberries are best known for their potent antioxidant and anti-cancer properties, and also provide anti-inflammatory and anti-tumor effects. Black raspberries antioxidant properties (as measured by the ORAC scale) are three times higher than blueberries! Black raspberry supplements such as capsules, soft gels, and powders are a testament to their health promoting properties. Black raspberries get their dark pigment from anthocyanins, which often stains my hands, lips, and clothing when harvesting. This dark pigment is responsible for their antioxidant awesomeness, and often used as a colorant or dye. According to research, anthocyanins help improve memory, vision, and heart health. Red raspberries are no nutritional slouch. They offer many of the same health benefits as black. They’re rich in vitamin C and manganese and a good source of dietary fiber. Fresh raspberries are great, but they don’t keep very long. After losing a couple harvests to mold in my fridge I started freezing them almost immediately to prevent that from happening again. Fortunately, freezing raspberries doesn’t significantly reduce their nutrition or antioxidant activity, and I think they blend better in smoothies when frozen. Raspberries may not be abundant where you live or you may not like them. In that case, I advise you to seek out the berries or fruit that you love in your local environment. Even better, go out and harvest something wild. Wild foods are more nutritious and who can’t use an excuse to get outdoors? I’ve been experimenting with ghee in my smoothies lately. I love coconut oil, but like to mix it up. If your ghee is solid, you may want to run a little warm water over the container to soften. Enjoy! 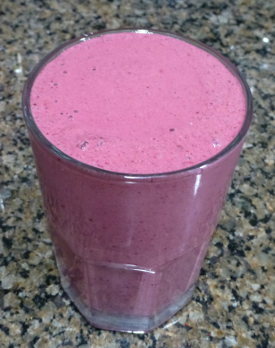 I would love to know if you try this radical raspberry smoothie. Are raspberries one of your favorite fruits too? Please leave a comment below. Happy Blending! Loving the raspberries…especially the black ones…I had some in my backyard and my neighbor’s that I picked often and since moving I miss them. So, now we go to the Pick-UR-Own farms and stock up! Loving them when they are in season with the peaches in my smoothies! Oh and thanks for the water article, will search out the Spring Water! The black ones are extra special :) My girlfriend and I visited a Pick-UR-Own last Sunday and stocked up too. I’ll have to try peach and raspberry in an upcoming smoothie. Happy spring water hunting!